Editor’s note: Karunyan Arulanantham is the executive director of the Tamil American Peace Initiative, an organization of Tamil Americans. The views expressed are the writer’s own. Amid the jungle and sandy beaches of northeast Sri Lanka’s Vanni region lie tragic truths the government has desperately sought to suppress in the four years since its civil war with the Liberation Tamil Tigers of Eelam (LTTE) came to a sudden and gory halt. On the Mullivaikal peninsula, between the Nanthikadal Lagoon and the sea just north of the town of Mullaithivu, the government declared a safe zone, where hundreds of thousands of Tamil civilians were trapped as they sought refuge from the bloodshed. What happened next is almost unimaginable. Seeking to crush the LTTE once and for all, the government proceeded to shell the No Fire Zone and surrounding areas after assuring the world that they would not use heavy weapons. The government declared victory over the LTTE in late May 2009, but in doing so, tens of thousands of innocent Tamil civilians were also killed by government forces. According to the U.N. Panel of Experts on Sri Lanka, as many as 40,000 civilians may have been killed during the war’s final stages, while “only a proper investigation can lead to the identification of all of the victims and to the formulation of an accurate figure.” Some analysts paint an even starker picture. The Catholic Bishop of Mannar, Joseph Rayappu, has testified that over 140,000 civilians remain unaccounted for since the fall of 2008. 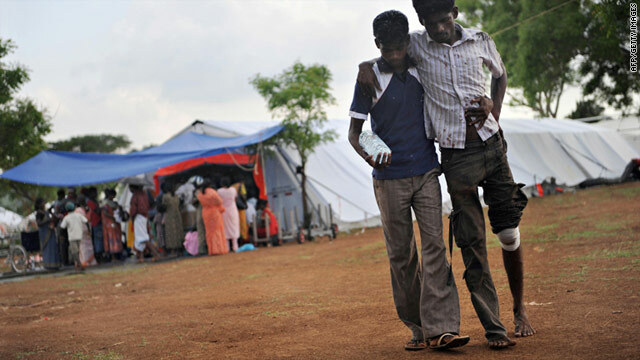 In March, the U.N. Human Rights Council (UNHRC) passed a resolution calling for the Sri Lankan government to “conduct an independent and credible investigation into allegations of violations of international human rights law and international humanitarian law” that occurred during the war’s final stages. But how honest are we being with ourselves when we ask a government that stands chief among the accused to credibly and independently investigate its own wrongdoing? In fact, the government continues to promote the very same climate of oppression and indifference that largely fueled Sri Lanka’s ethnic conflict and led to civil war. Meanwhile, the Tamils in particular continue to be marginalized, demonized and endangered. They are denied political representation and economic opportunity while enduring the seizure and militarization of their homes and lands. The latest reported land grab by the army is the alleged seizure of 6,381 acres of land belonging to Tamils in just one small northern area of Valikamam, although others have also been claimed. After the war, the government scrapped the singing of the national anthem in Tamil at official functions, and is quickly and decisively dismantling the cultural identity of the Tamils. Aware of all this, what is the international community waiting for? A U.N. mechanism that would allow the international community to act decisively and initiate independent investigations and conduct a U.N. supervised referendum on options for peaceful coexistence is long overdue. This is by far the best way to achieve real reconciliation. The Tamil people deserve to have their rights protected. Yet they now face a systematic attempt by a conquering, vindictive government to erase them from the country’s future and the nation’s collective memory. By definition, you can’t have reconciliation or stability when certain groups are perennially subjugated. Meanwhile, the Sri Lankan government has mounted an expensive public relations strategy that denies and distracts from the real issues the country faces. It promises to take meaningful steps forward, but only makes halfhearted attempts in the hopes that more years will pass, and the international community will forget. But forgetting the past will only ensure it is repeated. Judging by recent history, one thing seems clear: Sri Lanka won’t solve its problems on its own. Next entry »Can Obama, Xi Break summit stalemate? that race is THE PROUD SRILANKAN SINHALESE. I really feel sorry for LORD BUDDHA. continue to write in public in support of their cruelty. begging these srilankans for independent investigation. These blood thirsty maniacs are 22nd century incarnation of HITLER,just read above,you will realize how they are standing by the crimes they are committing. IF SRILANKA HAVE NOTHING TO HIDE AND BLAME ALL ON THE SO CALLED LTTE TERRORISTS, LETS HAVE THE INTERNATIONAL IMARTIAL INVESTIGATION. Hi Bother, you seem to be completely forgotten by now Sri Lankan troops got arms to save it's citizens from the world deadliest terrorist organization who did not care any lives whether it's Sinhala or Tamil or Muslim? Troops started this war when they realized that LTTE closed the Mavilaru tank to let starve thousand farmers during the so called peace period. Are you getting paid your balance share? May be.. But what we wantonly a long term solution to this issue now not to count dead bodied again and again and create non human; separatism. Today Sri Lankans want to live together after 30 years. we want equal opportunities to make our livelihood. Let's have a toast tonight for the total decimation of Tamil terrorists, who were branded by the FBI as the deadliest terrorists ever to walk on earth. drink tonight. No wonder Sri Lankan troops were commended by a number of US military experts on the planning and execution of the greatest humanitarian mission that rescued nearly 400,000 Tamil people from the grips of the Tamil terrorists. Actually, I think you'd probably control bokeh in post. Just a thought, but an interesting way you'd accomplish this is by combining the infinite depth of field camera with some sort of low power laser to do a depth map of the scene. if you recorded the two set of data together (could actually do a 2 pixel camera, 1 sensitive to the visual light, one which would record the laser reflections), you'd have the ability to really control just about everything about how the image ends up appearing. Could be interesting. USA's calling shots around the world are long gone – certainly not in South Asia. USA is currently running on flat tires of sorts and depends on China to keep its economy from crippling. Thanks to China and Russia that maintain a balance when it comes to USA created problems around the World while the USA is backed up by the so called UN in partnering Americans in crime activity in world politics. US Plays its thing with UNHCR while Tamil Nadu Chief Minister to support a Independent State for Tamilian people. UNHCR is a political instrument like Amnesty Int'l but it cant get separate state. UNHCR resolution is only a game US is playing to put China against India, using Sri Lanka as battle ground. Mullivaikkal was the largest single massacre in Tamil history Because the Tamil people demanded their right to be free as a nation, because they demanded their right to a homeland and their right to form a state. They not only demanded this, but they had built that state on their own. This demand was a challenge to the unitary state of Sri Lanka which the British created, India supported since the last phase of the Cold War. A UN internal report suggest the final death toll may have been over 70,000 and the Bishop of Mannar has said that 147,000 remain unaccounted for. Many more were horrendously injured , and over 300,000 rounded up and incarcerated in internment camps. What a funny argument to use. Did he do a comprehensive research? Are you an intellectual to believe? So believe me also. I am telling only 6000 died at the final phase. So you can believe me using the same theory of using Bishop’s data. At least I am a mixed person: 50% Tamil and 50% Sinhalese. I am balanced to even think about this situation. I really feel by seeing your and NY Nathan’s response here, how people have their own agenda to promote LTTE ideology and how much emotional and arrogant to do that. I know you are hurt because your god father Praba is dead today. But who cares you and your biased gangs? 20 million people in this country know how to live together. Who cares about the crying of 5% Sri Lankan for their own economic and political survival. We have an elected government by 61% of the population? 90% have voted against racism and separatism. Isn't that enough for you? Can you name a few so called independent organizations? We like to know. We don’t need paid people and paid organizations to appear as independent investigators. We know why you are so much keen on this because you already paid international media and other organizations to promote this independent investigation theory. Then you can deploy the next set of paid people to come here to investigate. We know how money works even in US and many other countries even at highest level. Don’t try to fool us. Both Sri Lankan Tamils and Sinhalese were fooled by all politicians and LTTE ideology here. Now I don’t think it’s easy to fool. I feel very sorry when I hear some Tamil's story here. They are 30 years behind because of so called freedom killers- LTTE. THey want to see them remain in the same situation. Then only they can manipulate them. If not for Sinhalese soldiers, Tamils would still be fooled by Fugitive Prabha. ****Have any doubts....? kindly watch channel 4-srilanka's killing fields-and see it for yourself what these srilankan sinhalese are capable of. Brother, we don't need to see films created by channel 4. We saw live horror film for 30 years. Seems like you have not seen any massacres done by LTTE. Very innocent, poor rural villagers, pregnant mothers, small kids.killed like dogs..we are laughing at LTTE sympathizers who are pretending exciting by showing a paid drama through channel four. We have some good pictures/live videos that you can enjoy with blood all over the body without some body parts removed by LTTE killers. How Many people in your channel four. may be 10-20 max. But we can show you 1000s innocent civilians killed by LTTE, who strongly supported by diaspora funding. Remember you enjoyed these incidents when LTTE did. I remember some university students celebrated these killings within the Peradeniya University, middle of no tamil community. Shame on you who never cared human for 30 plus years. now shedding crocodile tears. If not we defeated LTTE, they must have killed another 100,000 by today. However, I feel very sorry for civilian people killed (not civilian dressed LTTE cadres) during cross fire when LTTE used the no fire zone to escape, hide behind civilians to fire mortar guns etc. Those also should be considered as war heroes who sacrificed their life to save this country from brutal Praba and the gang. tamils from totally massacred by the srilankan governments. Well, the Indian tamil students are OUT ON THE STREETS asking for it.......WHERE ARE THE CEYLON TAMILS......??????? Tamils done a stretegic blunder with Rajiv gandhi sui cide blast and Gen-ocide of Indian Peace Keeping Force. Rajiv Gandhi lesson 101, Tamils bite hand that feed. We need international investigation to understand Tamil species. Lesson ONE not 101 ... China eats head they cut off of those who help them – see Tibet and the Mao Chinese Cannibalism when Mao fed his troops on them using his butcher commandos during the night ... even ate their own weakened soldiers to stop the cramps in HIS belly! ---– Oh so well done turning Mao’s HISTORY and flipping it! … Mao on his run from Chiang Kai Sheik … HUNGRY and CRAMPING UP without food … fed his army on poor peasants he captured (at night – using the butcher commandos) on his way into Tibet … at worst when he reached into the thousands of miles “barren” (still Indian Protectorate - by permission of someone gullible called NEHRU in India) plateau of Tibet he had to cannibalize his own army … secretly (using special butcher commandos during the nights and shuffling his platoons as patrols against Sheik’s army who were “phantomlike” FIXED rumor “pursuing” – NOT – and assumed killed!) culling weakened soldiers from diverted “patrols” – same taste as “pork” – ONLY a few know and the “NEW” from childhood the new education is an effort of smoke and mirror “creative” history to en-mass the (“knowledge”) PLOY and garner internal support (using the now evolving brain-washing Maoism-red-book) to overcome the knowledge trickling AROUND from the FEW of the “butcher commandos” – and wiping the knowledge of STEALING Tibet from under the WORLD’s nose – for ever! Courtesy of USA in MANY ways!